If you’re like the typical bridal couple, success is defined by the dance floor. If it is empty, the wedding celebration is considered a failure. If it is packed, it is considered a success. … and know how to motivate wedding guests to get out of their seats. Some Bradenton, Sarasota, and Venice brides want their reception to have the feel of a dance club, complete with high energy music and fabulous club lighting. And some like a combination. 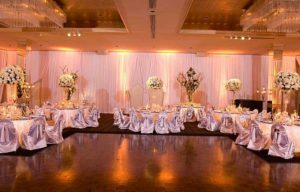 We’re flexible and tailor each event to the style of the wedding couple.